Czyżby to Q właśnie było? Gdyby nie ta nieszczęsna mała matryca to byłaby rewelacja wśród bezlusterkowców. Te dwa pokrętła z boku i lampa - proste i genialne rozwiązania. I podstawowy naleśnik ze światłem 1,9. Gdyby nie ta nieszczęsna mała matryca to byłaby rewelacja wśród bezlusterkowców. Jestem tego samego zdania. Ciekaw jestem do kogo właściwie jest ten sprzęt adresowany i po co są w tym aparacie wymienne obiektywy? Żeby nałapać kurzu do środka aparatu? Opis na fotopolis i na dpreview. Tak na szybko zebrałem zaawansowaną kompaktową konkurencję małego Qrczaka . I zgadniecie kto ma teraz najmniejszy, najlżejszy aparacik z ekwiwalentem 50mm i światłem 1.9? Inżynierowie z Pentaksa mnie rozwalili. Ciekawe czy Q będzie wzbudzał podobne uczucia opiekuńcze, co 110. *Shooting at 1/8000 - 2 seconds with Electronic Shutter and Bulb shooting are not available when using a lens that has no lens shutter. Number of shots: 2-9, Exposure adjusted automatically. Recording interval: 1 sec., 5 sec., 10 sec., 30 sec., 1 min., 5 min., 10 min., 30 min., 1 hr., Recording time: 5 sec. to 99 hr. * Using a new lithium-ion battery under the temperature at 23 oC, Tested in compliance with CIPA standard. Actual results may vary depending on the shooting conditions/circumstances. PENTAX is a trademark of HOYA CORPORATION. The PENTAX Q features the newly developed Q mount, with a mount diameter shortened to approximately two-thirds of that of the conventional K mount. This was made possible by reducing the flange back (the distance from the lens mount surface to the image sensor surface) to nearly one-fifth of that of the K mount, as well as by optimizing the size of image circle of its lenses to be proportioned to the size of the compact image sensor. The Q mount system also eliminates an optical finder, mirror box, focusing plate and AF sensor, making the PENTAX Q’s body the smallest and lightest in its class. The body has been made of magnesium-alloy, which gives an elegant, high-quality texture to the compact, lightweight camera body while improving its durability. 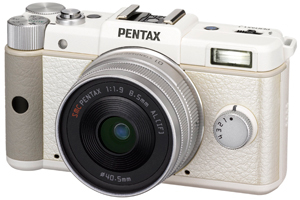 The PENTAX Q even offers a choice of white and black body colors. The PENTAX Q comes equipped with back illuminated 1/2.3-inch CMOS image sensor, which delivers beautiful, high-resolution images with approximately 12.4 effective megapixels. This is made possible by its high efficient light gathering optical construction that assures excellent high sensitivity and low noise characteristics and a high speed readout of image data signals. The PENTAX Q also features a new generation imaging engine integrating the best of PENTAX’s state-of-the-art digital imaging technologies, developed and accumulated over many years of digital SLR camera development. By coupling this imaging engine with exclusively designed, high performance Q mount lenses, the PENTAX Q delivers clear, high contrast images rich in gradation and texture, even at edges. With high sensitivity noise minimized, the photographer can use the entire sensitivity range – from ISO 125 to the highest ISO 6400 – without worrying about annoying digital noise. By taking advantage of the HDR (High Dynamic Range) function that produces one composite photo from multiple images, it’s easy to create beautiful images with an extra wide dynamic range and free of white-washed and blacked-out areas. 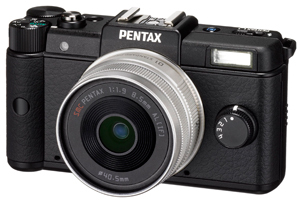 The PENTAX Q offers a totally new style of photo shooting. By coupling the new Smart Effect function offering nine distinctive visual expressions via the easy access Quick-Dial positioned on the camera’s front panel, the photographer can effortlessly add a desired finishing touch to an image, while previewing the effect on the LCD monitor. The Quick-Dial has four positions, to which four favorite Smart Effect modes can be assigned in advance. The ever-popular Custom Image and Digital Filter functions have been further enhanced to provide an even greater range of image processing tools. In order to customize the PENTAX Q to accommodate specific shooting styles and user preferences, the user can also assign other options such as a custom image setting, a digital filter or an aspect ratio setting to the Quick-Dial. Brilliant Color: Creates a lively atmosphere by raising the saturation level almost to the point of color saturation. Unicolor Bold: Creates an extremely high contrast image that retains one particular color in the image. Vintage Color: Produces a toy-camera-like effect, with a choice of several different finishing touches. Cross Processing: Produces a unique image with unusual colors, as if treated with the cross processing** used in film photography. Warm Fade: Creates a low contrast image with the white balance slightly shifted to pink shades. Tone Expansion: Produces a dramatic image with an artistic finishing touch, close to an intensified HDR (High Dynamic Range) effect. Bold Monochrome: Produces a low-key, high contrast image with enhanced sharpness. Water Color: Creates a watercolor-like finishing touch. Vibrant Color Enhance: Creates a flowery atmosphere with slightly enhanced contrast. USER: Used to enter a user-selected combination of custom image mode and a digital filter. ** A film development technique that uses an unconventional film developer to create a distinctive finishing touch with dramatic colors. The PENTAX Q comes equipped with a Full HD movie recording function employing the H.264 recording format, allowing user to capture high quality, extended movie clips (1920 x 1080 pixels) at a frame rate of 30 frames per second. The user can also take advantage of interchangeable Q-mount lenses to produce distinctive perspectives, or make effective use of the Smart Effect modes*** and other in-body movie editing tools to produce creative, dramatic visual expressions with great ease, even during movie recording. The PENTAX Q also provides a micro-HDMI terminal (type D), which allows the user to simultaneously output both Full HD movie clips and sound to external devices via a single terminal. The PENTAX Q comes equipped with newly developed bokeh control function, which allows user to capture the image with obtrusive objects in the field of view optimally defocused. With this function, the camera will automatically judge the focused subject as well as relative distance of each object from the camera in the field of view to apply optimal defocus effect to each object to stand out the main subject(s). This function will allow even a first-time digital photographer to easily capture the images with such effects as background defocus or foreground defocus that otherwise require certain extent of familiarity with the photography. The PENTAX Q incorporates the PENTAX-developed SR (Shake Reduction) mechanism, which automatically shifts the CMOS image sensor to offset camera shake detected by the camera’s motion sensor. As a result, the PENTAX Q produces sharp, blur-free images even under demanding conditions that are prone to camera shake, such as when using a telephoto lens, shooting in the dark without flash illumination, or capturing landscapes in the twilight. The PENTAX Q offers a host of user-friendly, functional features available only with digital interchangeable-lens cameras. Its top shutter speed of 1/2000 second freezes the decisive moment of the subject’s action. To accommodate user preferences and varying photographic applications, it also offers a choice of four different exposure modes: the user-friendly Programmed AE (P) mode that automatically selects an optimum combination of aperture and shutter speed; the Aperture-Priority AE (AV) and Shutter-Priority AE (TV) modes that allow the photographer to faithfully reproduce specific creative intentions on resulting images; and the Metered Manual (M) mode. It even allows the photographer to instantly switch from the P mode to the AV or TV mode with a simple turn of an electronic dial. The PENTAX Q features a large, easy-to-view, high resolution 3.0-inch color LCD monitor with approximately 460,000 dots. Its wide view design assures a clear view of the monitor from approximately 170 degrees horizontally and vertically, making it particularly useful in low and high angle shooting. The PENTAX Q’s DRII (Dust Removal II) mechanism effectively prevents annoying dust spots from spoiling captured images, even after the user changes lenses out in the open. Like PENTAX’s K-5 and 645D digital SLR cameras, it incorporates highly effective supersonic vibration mechanism, which vibrates image sensor at high speed to shake the dust off its surface. The PENTAX Q’s high speed burst shooting mode allows the photographer to record up to five images (in JPEG recording format) in a single sequence, at a maximum speed of approximately five images per second. This mode comes in handy when trying to preserve the action of fast-moving subjects in a series of images. The PENTAX Q comes with a built-in auto flash (guide number 7 at ISO 200/m). The photographer can either use it at the default position, or raise it to the pop-up position with simple operation to widen its discharge angle to cover a 28mm angle of view (in the 35mm format). **** Not compatible with UHS Speed Class transfer rate. Launched on the market together with the PENTAX Q, this optical viewfinder is designed for exclusive use with the new "PENTAX-01 STANDARD PRIME" unifocal standard lens. It offers a clear view of the subject even under harsh sunshine. It also assures image viewing of the subject with no time lag - an important feature in snapshot and portrait photography where the timing of shutter release is crucial. Exclusively designed for the PENTAX Q, this camera case has two strap lugs at its sides to keep the camera suspended in a level position, so that the photographer can quickly respond to unexpected shutter opportunities. With the camera inside, this high-grade case looks even more elegant, with a choice of white, black and red colors. Teraz nie będzie się mówiło podaj szeroki, podaj tele, lecz daj jedynkę, zapnij trójkę Era motoryzacyjna. * The distance from the lens mount surface to the image sensor surface. The High-performance series has been developed to bring out the optimum imaging power in the PENTAX Q digital camera by combining exceptional image rendition with effortless handling, while also offering a high grade finish. Featuring the state-of-the-art optics incorporating special optical glass elements and PENTAX exclusive lens coating technology, this series delivers beautifully defined, high quality images that are sharp and high contrast, even at their edges. The AF motor installed in the lens barrel assures smooth, quiet focusing operation. Thanks to the lens shutter mechanism, the PENTAX Q’s built-in auto flash can be synchronized even to the camera’s top shutter speed of 1/2000 second (or 1/250 second when using an accessory flash unit). The lenses are also equipped with a built-in ND (neutral density) filter, which comes in handy when shooting with open aperture at bright locations or when using slower shutter speeds. This unifocal standard lens has a focal length equivalent to 47mm in the 35mm format. Since it offers a natural perspective similar to that of the human eye, it can be used as a multipurpose, daily-use standard lens for many different subjects, including landscape and portraiture. With maximum aperture of F1.9, it not only performs superbly in dim locations, but also makes it easy to throw the background out of focus. Incorporating two high grade aspherical optical elements, this lens compensates various aberrations to a minimum and produces beautiful, high resolution images that are bright and crisp even at the edge of the image field. With a focal length coverage equivalent to that of a 27.5~83.0mm zoom lens in the 35mm format, this standard zoom lens is ideal for various applications in the wide angle to medium telephoto range. Incorporating a total of four extra-low-dispersion and low-refractive aspherical optical elements in its optics, it assures exceptional image rendition while effectively reducing chromatic aberration to a minimum over the entire zoom range. 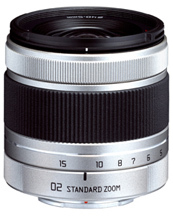 It also offers a minimum focusing distance of 30 centimeters at all focal lengths to simplify close-up photography. This series offers outstanding value against its price, and allows every photographer to produce a variety of distinctive, dramatic images simply by altering the angle of view and perspective through quick, effortless lens changes. They all feature manual focus operation, fixed aperture and plastic lens mount, and have no lens shutter unit — the main factors contributing to the massive reduction in size and weight and making them far more affordable than conventional interchangeable lenses. This ultra wide angle lens offers an extra wide angle of view of 160 degrees along the diagonal line of the image sensor, allowing the photographer to create a fish eye visual effect with great ease. Thanks to its distinctive ultra wide angle characteristics, it produces unique, eye-catching images unlike those captured by the human eye, with an exaggerated perspective, distorted subjects, and a pan-focus effect that captures every element in the image field in sharp focus. With their optics designed specifically to retain various lens aberrations, these lenses produce subdued, heartwarming images like photos taken by a toy camera. 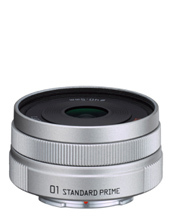 The “PENTAX-04 TOY LENS WIDE” is a unifocal wide angle lens with a focal length equivalent to 35mm in the 35mm format; the “PENTAX-05 TOY LENS TELEPHOTO” is a unifocal medium telephoto lens with a focal length equivalent to 100mm in the 35 format. When attached to the “PENTAX-01 STANDARD PRIME” or “PENTAX-02 STANDARD ZOOM”, this 40.5mm polarizing filter minimizes reflections on the water or glass surface, which are difficult to remove during digital processing, to assure crisp, high contrast images. A metallic, dome-shaped lens hood for exclusive use with the “PENTAX-01 STANDARD PRIME” lens. A plastic, square-shaped lens hood for exclusive use with the “PENTAX-02 STANDARD ZOOM” lens. Cóż można się było spodziewać, że jak już Pentax coś zrobi, to na 100% nie w oparciu o trendy rynkowe i nie tak jak inni. Trzeba przyznać, że jest oryginalnie, ale kto liczył na EVIL do Pentaxa ten się przeliczył. Za cenę gorszej jakości zdjęć (nie testowaliśmy jeszcze aparatu, ale jest to po prostu nieuniknione) osiągnęli prawdziwie "kompaktowe" wymiary korpusu. Pamiętam, że oprócz tego ma wyjść również w formacie APSC.